There was a patriotic good time happening in High 5 Casino during the month of July! There were FIVE new games that splashed into the casino lobby, as well as three new tournaments, a load of XP events, and the final winnings for the Back of the Net Tournament! As of the end of July, H5C players can now find a vast variety of 264 slot games in their casino lobby. The slot games that were added to the library were Empress of Time: Destiny, Morgan Le Faye, Stackin’ Kracken 7s, and Forces of Nature. 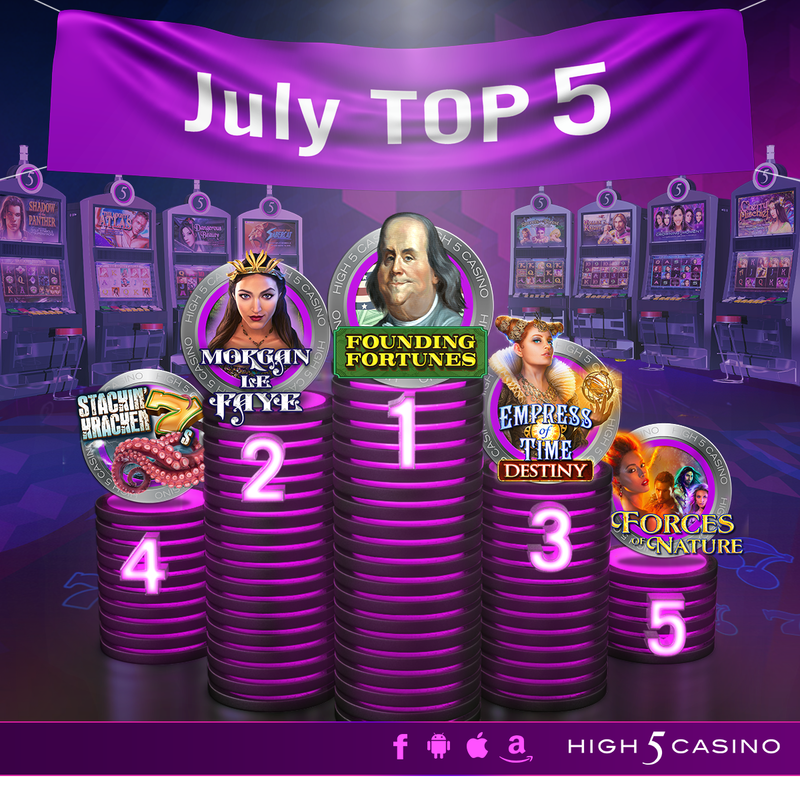 At the beginning of the month, High 5 Casino debuted its new Fourth of July seasonal game, Founding Fortunes! Each new slot game release was followed by a themed XP event, where players enjoyed leveling up their Game Level in selected slots with either 2XP, 4XP, and even 5XP! The XP events were not just limited to the weekends. On Wednesday, July 4th, players took their Independence Day celebration to H5C, enjoying either a 2XP or 4XP boost in Founding Fortunes! High 5-ers also celebrated the American holiday with 2XP in Grand Ol’ 7s on the Fourth of July and Daughters of the Regiment on July 5th! July also marked the ending of High 5 Casino’s Back of the Net Tournament! With a total of four soccer matches, the tournament concluded with the victory of France. How many Back of the Net Tournament predictions did you get correct? High 5 Casino wrapped up the month with a player-contest! To celebrate the summer and the upcoming vacations players will embark on, we invited High 5-ers to enter H5C’s Summer Vacation Contest! Players were encouraged to submit a contest entry by filling in the blank on which H5C slot game they would take a vacation trip to and why. With almost three thousand entries, 125 lucky winners received a 200K coin prize on Tuesday, July 31st! There was a firework display of fun-filled spin-tastic events that July 2018 brought! High 5-ers spent over 2 million hours spinning the H5C reels over 1 BILLION times! Top 5 games played in July: Founding Fortunes, Morgan Le Faye, Empress of Time: Destiny, Stackin’ Kracken 7s, and Forces of Nature! Which game gave you your High 5 Moment in July? What did you enjoy most about High 5 Casino last month? Comment in the conversation bubble located on the top right corner of your screen and let us know! This entry was posted in H5C Stats, High 5 Casino, High 5 Games, High 5 Moments, top games and tagged Android, Apple, Bonus Select, Facebook, game preview, Game Spotlight, Google Play Store, H5C, High 5 Casino, High 5 Casino Mobile, High 5 Games, High Limit games, Hoot Loot, iOS, iPad, iPads, iPhone, iPhones, Player Spotlight, Secrets of the Forest, Shake the Sky Casino, Shake the Sky Casino Mobile, Slot Fundamentals, slots, social gaming, Split Symbols, statistics, Super Stacks by hoothigh5. Bookmark the permalink.